The Relief Society presidency came recently for a visit, and I happened to remark how happy I was that I was the one being visited rather than one of the ones who were tasked with visiting every woman in the ward. I acknowledged how hard it must be to have stewardship over all the women in the congregation. There are so many needs — births and deaths, people moving in and people moving out, catastrophic illnesses, unemployment, problems with rebellious children, marriages that are struggling, and problems that I cannot even fathom. I don’t even know a fraction of these problems. All I know is that, based on my observation, most of the families in the ward are dealing with some issue or another. Some are big; some are small. Mine may be more conspicuous because I come with a wheelchair or a walker, but make no mistake — many people are suffering and need help of one kind or another. I am only glad the buck does not stop with me. For some reason I went on to say how glad I was that the buck of church leadership has never stopped with me. When I was in high school I was Little Miss Pep and Energy. If there was a club in the school, I was president (unless it met at the same time as another club in the school over which I was president). I was the editor of the school newspaper. I was the world’s worst yearbook editor. I was the varsity boys’ basketball scorekeeper. I wasn’t pretty enough to be a cheerleader so I was captain of the pep club. I was secretary of the student council. You get the picture. I was positively sickening. So when I joined The Church of Jesus Christ of Latter-day Saints and learned that people take turns leading the various organizations, the first thought I had was that this was right up my alley. I could do this in my sleep! I was stunned. What? I already had the best ideas. I already knew exactly what to do. Didn’t the Church need me? Actually, the Church did need me, and it does need me. It needs the thousands of people just like me. The reason is simple. Only one person can be at the top of any organization. That person cannot succeed unless the rest of us hold that person up. One of my favorite pieces of artwork probably isn’t a very good piece of art, but it is a constant reminder to me of what my job is as a member of the Church. The painting "Victory, O Lord" depicts the scene from Exodus 17:10-12. In that scene, God had told Moses that as long as he held up his hands, the Israelites would prevail in battle. As soon as he lowered his arms, the Israelites would fail. 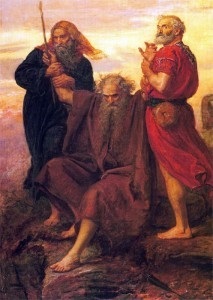 Moses held up his arms as long as he could, but eventually his strength was spent. He could hold up his arms no longer. The Israelites were doomed. So Moses’ brother Aaron and a follower, Hur, took Moses to a rock and had him sit down. Then they held up his arms for him so the Israelites would win. I love this painting because it shows the terror in Hur’s eyes. He knew exactly how important it was that he held up his leader. If he failed to support, or sustain, Moses, all of Israel would be doomed. In a sense, we who follow are all Aarons and Hurs. The success of our leaders rests upon our shoulders. I do not consider it any small thing that I have been assigned to be a lifelong cheerleader. In fact, it is an honor that I take seriously. Some people are hurt that they are never asked to be the leaders of an organization. They feel sorry for themselves, possibly with some justification, because it is the “same ten people” who rotate from one leadership position to another in every ward, or in every stake. I know I am always happy when I see a bishop or a stake president who is wise enough to choose a Relief Society president or another ward leader who is a dark horse. Sometimes I am just a little annoyed to see a Primary president released to be called as Relief Society president, who is then released to be the president of the Young Women. But then, we don’t know what goes in to choosing those ward leaders, either. I was recently visiting with one of my favorite dark horses, and I was stunned when she told me she had been asked to be a Relief Society president not once, but twice, and had turned the calling down on both occasions. She told me why, and I could see why she had done it. But the bishops who had asked her to serve as Relief Society president had then gone on and chosen one of the “same ten people” had been criticized for it on both occasions. The criticisms had been unjust, because one of the same ten people had not been those bishops’ first choice. I have heard bishops say we have no idea how many people have turned down a particular calling before someone finally accepts it. We all expect it is hard to fill a calling in the nursery, but we don’t expect that people are turning down callings to be Young Women president or high priests group leader. Nevertheless, it happens. When people keep turning down the bishop or the stake president, it comes as no surprise when he turns to the “same ten people” — people they know are not going to turn down a calling, but who are going to do a great job in any position. Another reason that one of the same ten people are called may just be that a ward needs a particular person in place at a particular time, even if it is a person who has been used time and time again. Our current Relief Society president is one of those people. Our ward has really been hammered in the past couple of years, with catastrophic illnesses, personal crises, and even deaths. Right now we don’t need just any Relief Society president. We need a five-star, cream of the crop Relief Society president. Fortunately, we have one. I do not covet her job. The things I know about would weigh anyone down like an anvil, and I barely know anything. I only see the waves on top of the ocean. The sharks and the jagged coral reefs below the surface are invisible to me, but Rosie sees all of them. She knows where all of them are. It is her job to know, and to care, and to keep these things in her confidence. I would not want that responsibility. There are some, however, who do. There are some people who agonize because they have never been chosen to lead the Young Women or the Relief Society or to shepherd the Primary children. There are many men who are raised from boyhood with the idea that they will be failures if they are not called to be bishops. Fluffy and I will celebrate our 39th wedding anniversary this year. In that time, we have had twelve — count ‘em! — bishops. When you consider that a ward generally has about 400 persons in it, for us to go through only a dozen bishops in that amount of time tells you that there are few men who are called to be bishop. If the rest of the men in the ward are failures, there are a lot of failures in the Church. Not everybody who would be a good leader can be a leader, just because of the logistics of the thing. But those leaders can never succeed unless they are held up, Hur-like, by an army of good followers. I try not to gossip about the people who lead. If I see something they could be doing a little better, I try to keep my mouth shut about it. This is not easy for she who knows everything, but everybody has a different way of doing things. But if I see something they are doing that is dangerously wrong, I try to go to them, rather than going to other people and making it a matter of gossip. I try to help leaders out when I have an area of expertise. For example, I can do funeral dinners in my sleep. Our current ward does not have a lot of experience in funeral dinners. If we have need of a funeral dinner, and if someone asks my advice, I will give it. However, it is then my job not to notice if they do not take my advice. Sometimes they may even do it better than I would. I try to be available if ward leaders want to confide in me. Be advised that when ward leaders confide in you, they will do it in the most general of terms. Names are never mentioned, circumstances are changed to protect the innocent, and (above all) your absolute confidentiality is expected. If people were in my social circle before they were called to a position, I make sure to keep them there afterwards. Most of my friends tell me that as soon as they’re called to a responsible position, most of their friends drop them like hot rocks. News flash to the rest of you: They still need friends, just as they did before they got their callings. In fact, they are probably more in need of friendship. I look for things ward leaders are doing right, and try to remember to compliment them on it. Sometimes I compliment them to their faces. Other times — and these may be the more important times — I point out the good things they are doing to other people. If I am asked to do something, I try to do it. Yes, visiting teaching is a pain in the neck. Try being a good visiting teacher when you don’t have working feet, and when you have a person who does not want to be contacted. But otherwise, I’m uber-reliable. I’ll try to be a better visiting teacher. Maybe. Only one grain of sand can be at the top of the pyramid. Maybe there are a few more that are near the top, holding up that uttermost top grain of sand. They have a pretty good view, too. The rest of us are destined to be down below, holding up the people on top. The ones at the top may have the view, but they pay for it with the responsibility. As for me, I’ll be down below. There have to be a lot of cheerleaders in this world. Being a cheerleader is good enough for me. Besides, we get to wear the cute little skirts.